At the Kitty, Kitty Cabana, the hottest spot north of Havana! Yes, Barry Manilow might not have sung about the venue that is central to the theme of this new Microgaming slot but he certainly inspired it. Kitty Cabana is a feline-themed slot that combines animated cats with drinks, chilling, and pampering themselves. 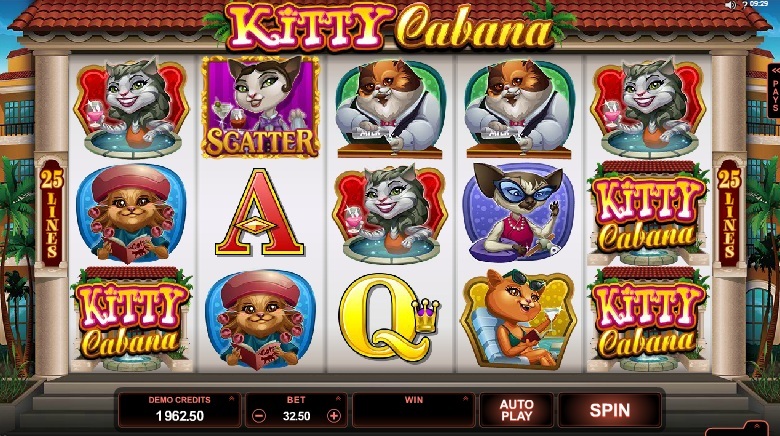 Kitty Cabana is a 5 reel, 25 payline from Microgaming and takes the route of using cats as its central theme. We all know that there are a number of previous titles that have also used cats in their themes but have they used them to such comedy effect? You can be the judge. The symbols on the reels are based on a number of different cats. Unfortunately, I'm not a cat expert so could not tell you what species of cat they are but there is the cat getting her hair treated, the cat relaxing in the pool with a cocktail, the cat getting her nails done, the cat sunbathing, and the fat cat serving the drinks. There are also the Jack-through-to-Ace symbols. The Kitty Cabana symbol represents the Wild. In almost an identical style to Microgaming's sibling release of Hound Hotel, these Wilds not only substitute for all other symbols, except for the Scatters, to complete winning combinations but they also act as Dashing Wilds. This is a randomly triggered feature that will see three Wilds appear on the reels and move across the reels before coming to a stop when the reels cease spinning. This can result in you hitting some decent wins. You can also trigger the Kitty Cabana Bonus. You will need to hit three or more of the Kitty Scatters across the reels to trigger the feature. Once triggered, you will be taken to three separate floors and must choose a door on each floor. The first floor will be where you choose which Bonus Wild feature you win. This can be a choice from Stacked Wilds, Expanding Wilds, Frozen Wilds, Split Wilds, and Wild Reels. The second floor is where you select your multiplier value. Finally, the third floor will determine how many free spins you earn. It is possible to earn up to 24 free spins. 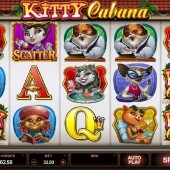 Kitty Cabana is a part of a typical Microgaming batch launch of slots where it has the same features as Hound Hotel. You can win up to 110,000 coins on this game but that does not really compensate from the fact that it plays like Hound Hotel but pays out less. Great! The Dashing Wilds are fantastic to see again though and the Bonus Wild features can distract you in the short term but do not expect to gain any longevity in your play time here. If you love your cats but want more bang for your buck then check out the legendary Cats slot from IGT or the absorbing Kitty Glitter slot from the same developer.